A University of Derby student has won the East Midlands Fashion Awards 2018 for her womenswear collection. Freya Whittaker, a third-year Fashion student, entered her womenswear collection titled WORKER based on a psychological concept called deindividuation that focuses on the loss of identity in the workplace through wearing a uniform. Freya Whittaker said: “My collection expresses the notion of deindividuation in contemporary culture by exploring the relationship between white collar and blue collar work, and also the concept of ownership between the two. I have explored this relationship by juxtaposing blue and white collar fabrics, using bold provocative statements, conceptualised printed images and fabric manipulation. Freya presented her collection using models on a catwalk along with other shortlisted students from other universities. Three students from the University of Derby – Yu Chiou Chen, Emily Clarkson and Abhirami Vijayakumar – also featured their work. The awards are run by Fashanne and is currently the only fashion awards for students in the East Midlands. There are four main awards; Knitwear Design, Textile Design, Footwear & Accessory Design and Fashion Design, which Freya won. 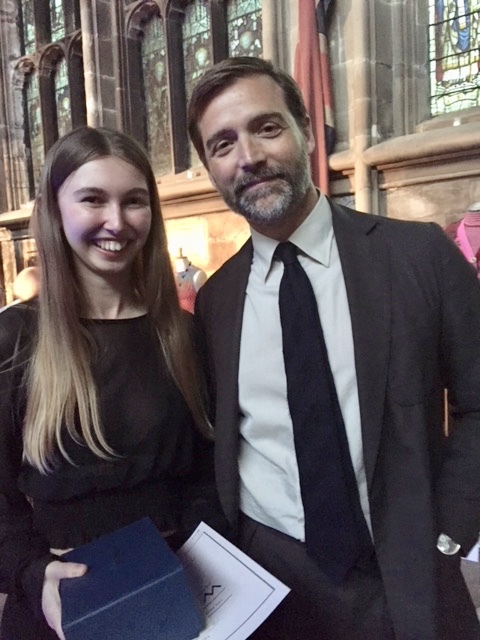 The judging panel included Patrick Grant, fashion expert and TV presenter, Simon Platts, Sourcing Director at ASOS, and Daniel Hanson, Designer & Consultant who is to receive an honorary award from the University of Derby this summer. Fiona Hawthorne, Senior Lecturer in Fashion at the University of Derby, said: “’Freya developed WORK#ER, which was aesthetically strong in the experimentation of oversize cutting and included the application of the text to fully endorse the concept.